On the Rate My Professor website one student wrote:"Dr. Qadri is nice, but very focused on teaching about the Muslim religion, not DIVERSE populations... Unless you want to learn everything about Muslims and nothing about anyone else, drop this class and take someone else." Not surpisingly, Qadri is also helped in her efforts by CAIR Tampa director Ahmed Bedier and her husband Kamran Qadri who teaches at Valencia College. The assistent professor is the CAIR director of Educational Affairs and a board member. Besides trying to force students to intern as teachers at the Muslim Academy of Central Florida where she was a former principal,she teaches them about Islam under the guise of sensitivity training about Muslim students. Qadri and CAIR are also exploiting the Association for Supervision and Curriculum Development to push their Islamist agenda. MIM: The ASCD would be well advised to divest themselves of CAIR's Yasmeen Qadri as would the Jewish Day School whose former director is listed as a reference on her resume. CAIR and Qadri at work indoctrinating students about Islam under the guise of teaching them how to be sensitive to Muslim students i.e. by 'reverting' to Islam themselves and not remain in their inferior 'kuffar' state. 22/06 EDF 2005 3 3 1 4 I would not recommend this teacher. She seems like a nice person, but she was confusing. I didn't learn anything from her class. She even told us that she doubts her own career choice of being a teacher and that we should question if it's really the right decision for us. Not supportive or helpful at all. 2/5/05 EDG 2701 2 3 2 1 Dr. Qadri is nice, but very focused on teaching about the Muslim religion, not DIVERSE populations. Class is sorta boring, but tests are hard and detail specific. Unless you want to learn everything about Muslims and nothing about anyone else, drop this class and take someone else! MIM:Da'wa tapes made by Qadri, her husband Kamran and Ahmed Bedier. Bedier's role in making 'educational tapes' is more proof that Qadri's position as education professor is being exploited by CAIR to push their Jihad through conversion efforts into the the school system. Diversity has become a buzz word in education, particularly after the September 11 events. Educators have been challenged to teach students about the Middle East crisis, and the most challenging aspect is presenting an unbiased perspective. Hear about a model that will help prepare students to be productive citizens in a global community. 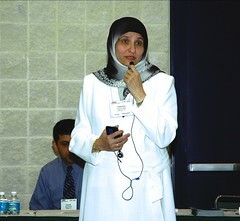 MIM: This year both Qadri and her husband Kamran presented a paper at the Islamic Society of North America conference. She was listed as the Education Coordinator at Valencia University and the Director of Educational Affairs of the Council for American Islamic Relations. MIM: Qadri uses the concept of diversity as a euphemism for cultural Jihad - i.e. forcing Americans to learn about Islam in the hopes that they will 'revert' to their original Muslim state. Note that she speaks of "strategies to accomplish these goals". As more Muslim children become visible in U.S. public schools, the need to enhance religious tolerance and accommodate differing religious expression has become increasingly essential in the school setting. Strategies to accomplish these goals were addressed in Saturday's session "Muslims Are Americans, Too: Embracing Global Education in the 21st Century." Yasmeen Qadri, professor of education at Valencia Community College, encourages students to embrace commonality. "The model I wish to present begins with making students aware of their American citizenship," said Yasmeen Qadri, professor of education at Valencia Community College, Orlando, Fla. "I encourage students to see the commonality with their fellow students in being American citizens." Embracing their common U.S. citizenship breaks down barriers and helps children understand why some children may dress differently and why they do certain things to honor their religious customs, Qadri said. "This kind of dialogue is helpful for students because it helps build bridges across the different customs," Qadri said. Ahmed Bedier, communications director for the Council of American-Islamic Relations (CAIR), Tampa, Fla., discussed the First Amendment and the Equal Access Act of 1984 that protect religious expression in institutions that receive federal funding, such as school districts. "In making decisions as educators, you cannot discriminate against students' practice of religion or fail to accommodate their religious expression needs," Bedier said. The First Amendment protects students' rights to religious expression, such as prayer, fasting, religious observance, special clothing or special dietary needs. The Equal Access Act affirms the right for student-initiated religious activities in public schools. Common excuses for failing to accommodate students' special religious needs, Bedier said, include, "if we accommodate you, we have to accommodate everyone" or "our policy forbids it" or "other students have never requested such a thing." "It's a right for our children to observe our holidays just as other children have the right to observe Christmas," he noted. "Also, policies are made to be amended according to circumstance, and just because one student doesn't recognize a religious observance, that's their business, but if another student does, that's their right." Read articles from the Educational Leadership issue "The World in the Classroom," including Susan L. Douglass' article "Teaching About Religion." ASCD members can log in to read all the articles from this issue. Not a member? Learn how to join ASCD. Practices for Training Teachers in Multicultural Education. Training Teachers in Multicultural Education. * Marriage: Is it an End to Education? Is it a Myth of Reality? * Catholic Social Services, Inc.